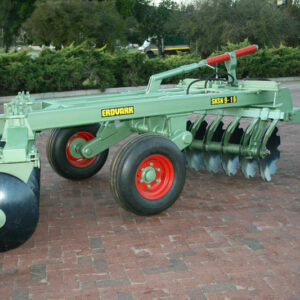 This robust 3-point Disc Harrow is for smaller tractors in vineyards, orchards and vegetable cultivation. High tensile disc axle of 32 mm diameter fitted with maintenance free Erdvark bearing units plus 22″ (540 mm) discs at 9″(228 mm) spacing. 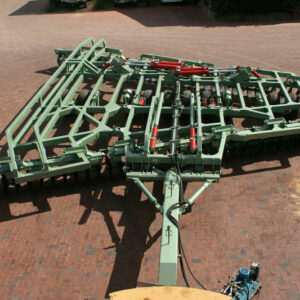 This robust 3 point Tandem Disc Harrow is for smaller tractors in vineyards, orchards and vegetable cultivation. The Tandem Disc Harrow is more stable in hillside cultivation than offset disc harrow. High tensile disc axle of 32 mm diameter fitted with maintenance free Erdvark bearing units. 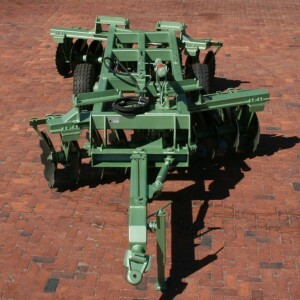 The Disc Harrow is fitted 22″ (540 mm) discs and 20” (510 mm) on the outside. Disc spacing is 8″ (203 mm) or 9″ (228 mm). The Erdvark Trailed LD Offset Disc Harrow is ideal for light soils to do seedbed preparation,weed control, undercut of stubble and vegetable left overs. The WKS is fitted with the Erdvark bearing unit and high tensile disc axle of 32 mm diameter with 22” (560 mm), 24″ (610 mm) or 26″ (660 mm) discs and 9″ (228 mm) disc spacing. The Erdvark Heavy Duty Offset Disc Harrow is ideal for cultivating all soil types and weighs 110 kg per disc. The SKSN9 Offset Disc is perfect for preparation of seed beds, weed control, cutting vegetable lands and stubble after harvesting. The Disc is fitted with high tensile disc axles of 45 mm in diameter and 26″ (660 mm) or 28″ (710 mm) discs with a disc spacing of 9″ (228 mm) for a finer cut. The Erdvark general duty Offset Disc Harrow is ideal for cultivated lands without solid objects with a weighs of 100 kg per disc. This Offset Disc is perfect for preparation of seed beds, weed control, cutting vegetable lands and stubble after harvesting. The Offset Disc is fitted with high tensile disc axle of 45 mm in diameter and 26″ (660 mm) or 28″ (710 mm) discs with disc spacing of 11″ (280 mm). The Erdvark Heavy Duty Offset Disc is ideal for cultivated all soil types with a weight of 110 kg per disc. This Offset is a perfect implement for preparation of seed beds, weed control, cutting of vegetables lands and stubble after harvesting. This Offset are fitted with a high tensile disc axle of 45 mm diameter and with 26″ (660 mm) or 28″ (710 mm) discs with disc spacing is 11″ (280 mm). This Erdvark Double Disc Harrow is suitable for uneven terrain and hilly conditions with independent depth control. 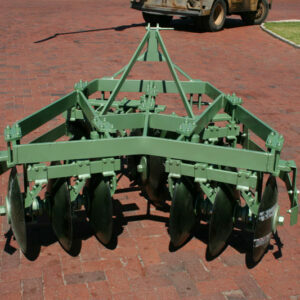 This Offset Disc is ideal for the cultivation of all soil types with a weight of 120 – 135 kg per disc. 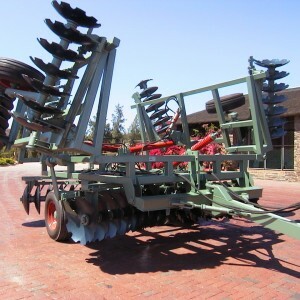 This unique Erdvark Disc Harrow is ideal for the preparation of seed beds, weed control and cutting of stubble after harvesting. This Offset is fitted with high tensile disc axles of 45 mm in diameter and 26″ (660 mm) or 28″ (710 mm) discs and disc spacing of 11″ (280 mm). The Erdvark SKF Heavy Duty Offset Disc has foldable wings for easy transport. 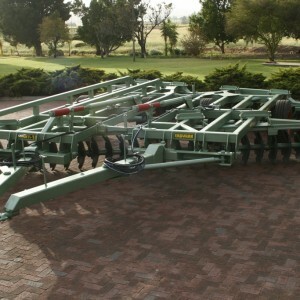 This wide span Disc Harrow is ideal for all soil types to do preparation of seed beds, weed control and cutting stubble after harvesting. The Heavy Duty Offset harrow has high tensile disc axles of 45 mm diameter fitted with 26″ (660 mm) or 28″ (710 mm) discs and a disc spacing of 11″ (280 mm). The Erdvark STF Tandem is a wide span disc with foldable wings for easy transport. The Foldable Heavy Duty Tandem is an ideal wide span disc for preparation of seed beds, weed control and cutting stubble after harvesting. 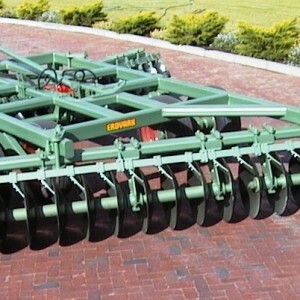 The Heavy Duty Tandem Disc has high tensile disc axle of 45 mm diameter fitted with 26″ (660 mm) or 28″ (710 mm) discs and disc spacing of 9″ (228 mm) or 11″ (280 mm) ideal for cultivating all soil types and trash. 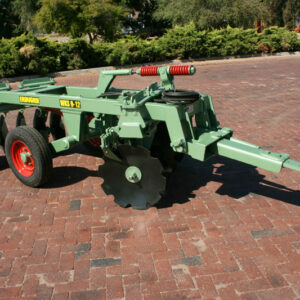 Erdvark Is known for its heavy duty and reliable implements for tuff African conditions. Reliable maintenance free bearing units with long service life distinguish Erdvark from other competitors in the market. 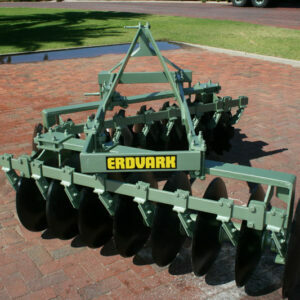 Erdvark specializes in disc implements and different grader options. These two implement ranges cover from light to heavy duty and with sizes to suit all tractor sizes and kilowatt ranges.